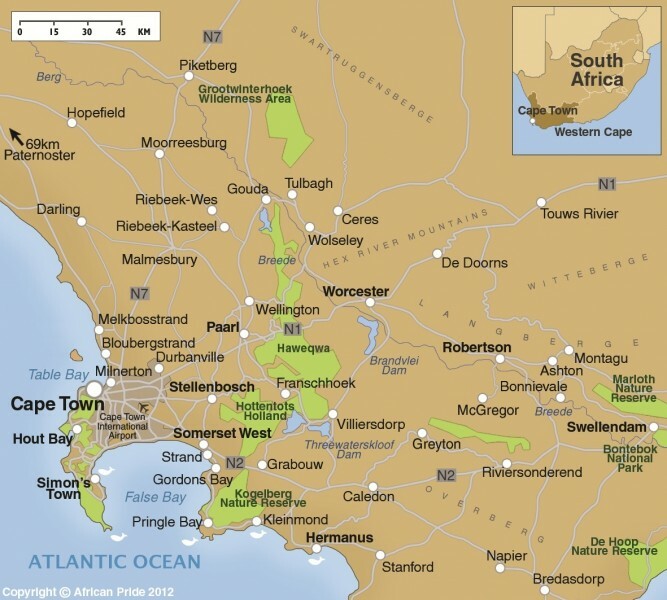 The heart of the Winelands lies between the historic towns of Franschhoek, Paarl and Stellenbosch. 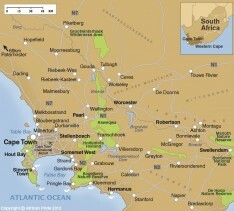 However the wine growing region extends south to Hermanus and north as far as Tulbagh. Here you will find many small hotels offering high standards of comfort and food together with the opportunity to sample the fine local wines, brandies and liqueurs on the near-by estates. The region is full of history - for example, French Calvanist protestants fled France to escape persecution and founded Franschhoek, meaning 'French Quarter', in 1688. Throughout the Winelands there are signposted wine routes and even a brandy route from Stellenbosch to Worcester! Remember, South Africa has very strict drink-driving laws and we would recommend an organised trip when visiting the wineries.